A rather recent trend in molecular science has been to use the technique to extort genes to reveal the history of how a plant has extended it’s geographical distribution throughout time. I have written about how researcher James Worth used molecular techniques to pinpoint the locations (refugia) where Myrtle Beeches (Nothofagus cunninghamii) survived during the last glacial period. Just earlier this year, researchers Paul Nevill, Gerd Bossinger and Peter Ades published a paper in the Journal of Biogeography doing the same for the Mountain Ash (Eucalyptus regnans). As in James Worth’s Myrtle Beech study, the researchers looked for variations at specific locations in the chloroplast DNA in Mountain Ash individuals distributed throughout the species natural geographical range. Different individuals may exhibit specific sequences which may differ from region to region and these are known as haplotypes. A large amount of haplotypes found in a population an any given area would suggest that the area is a glacial refugium as we would expect a species to have persisted for longer periods of time in a refugium, thereby accumulating genetic changes. Conversely, places with low diversity of haplotypes could be construed to have been colonized after the glacial period ended, as there wouldn’t have been time enough for a high diversity of haplotypes to develop. The results of the study showed that Mountain Ashes of the Northeast and Southeast of Tasmania has a high diversity of haplotypes, many of which were unique to the region. This suggests that the Northeast and Southeast of Tasmania harbored refugia that sheltered Mountain Ashes during the glacial period. By contrast, the central parts of Tasmania had a lower diversity of haplotypes. Another way of interpreting this was that there was fixing of haplotypes in that region, suggestive of a more recent colonization of the area following the end of the glacial period. One consideration that remains to be addressed is the ease with which Eucalypts hybridize. 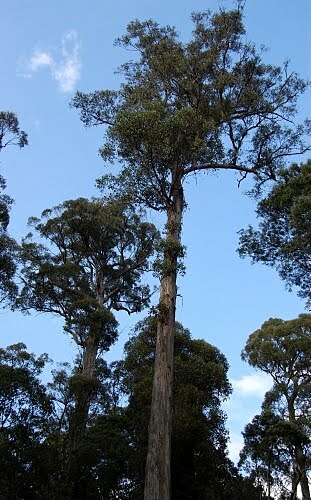 E. regnans for example may hybridize with E. oliqua (Stringybark) and E. delegatensis (Gum-topped Stringybark). Hybridization may result in chloroplast sharing between species and a more comprehensive study will probably be needed to ensure that all these factors are taken into consideration. For now it seems we are getting closer toward reading the the silent tale of survival that the ancestors of the Mountain Ashes in the Northeast and Southeast have etched in the genes of their descendants. This entry was posted in Biogeography, Eucalypts, Evolution, Hypotheses, Molecular Evolution, Trees and tagged chloroplast haplotypes, Eucalyptus regnans, Gerd Bossinger, glacial, glacial refugia, Mountain Ash, northeast Tasmania, Paul Nevill, Peter Ades, phylogeography, refugia, southeast Tasmania. Bookmark the permalink.